When speaking about our children each of us will agree that safety is always in the first place. For each family the day comes when your lovely baby starts to explore the world around it by climbing, crawling and reaching for all things that are situated around. We all understand that many of these things are quite dangerous for the toddler and have to be constantly on the alert to do everything to protect our children. But believe us, in the majority of cases it’s almost impossible to anticipate what will be the next destination point for your toddler and what he is going to do. In order not to be in a panic each time when the kid becomes quiet and think through all the troubles that may happen with it, a great decision of this problem was created. A baby gates. The main purpose of the baby gates is providing a complete safety to your kid at the same time giving it more than enough room. Nowadays there are so many baby gates available for purchase in online stores or in the market, that is quite hard to choose the most suitable option for all your needs. In this article, we are going to review five best retractable baby gates from different manufacturers to simplify your choice and save your time. If you want to provide your baby with a really good safety, pay attention to each of these options, each of them worth purchasing. Let’s start! Size of the baby gates. We tried to choose options for the comparably small homes, saving you from the problem of free space after installing the gates. Design of the gates. We picked the most minimalistic options which design will fit many homes and doesn’t look ridiculously. All the gates are retractable. We present you only the retractable options, giving you the ability to take gates down when you don’t need them anymore. Now we are ready to review all options and consider main advantages and disadvantages of each of them. Let’s start! We are going to start our review from the Retract-A-Gate Safety Gate. Let’s start with the durability, we think that it is the most important feature when it comes to baby gates. The first option in our list is made of the durable mesh and will excellently perform its main task. The gate is durable and this is a great feature, but because of this a disadvantage also occurs- gate is quite heavy. With the weight of four pounds, this option is one of the heaviest in our list. Nevertheless, this is one and only drawback. Among other advantages is the availability of two different gate’s sizes, so you will be able to choose the most suitable one. You can choose either seventy-two-inch width or fifty-two-inch width of the gate. 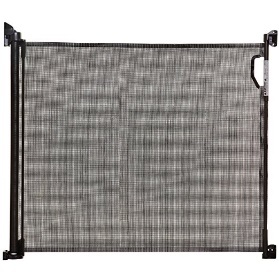 The fabric of the Retract-A-Gate Safety Gate is not only tough and durable, as we have mentioned above, but is also see-through, which means that your child will be able everything you do and interact with you or other family members through the mesh. In addition to this, the fabric is scratch-resistant, so if you have a cat and are afraid that it may scratch the gates (it will do it, believe us! ), you shouldn’t worry, gate’s fabric will not be torn or damaged because of it. When purchasing this option, you should also note that you will have to install the gate by yourself. It will not be a problem and don’t take much time, but you need some tools to install it properly. Check the bottom of the gate while installing, because if it will be placed high enough on the floor, the toddler can squeeze through. 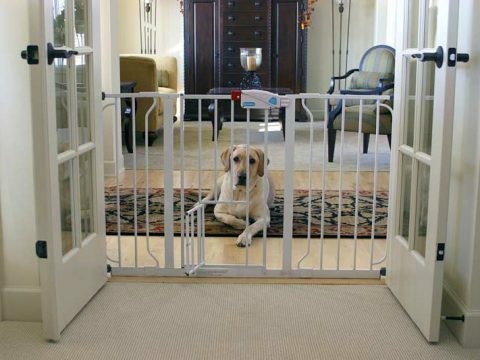 This gate can also be used as pet gate because if installed properly it is very firm. One more advantage of this gate that many parents love is the childproof baby lock that is included in the locking mechanism of this option. Gate is designed in three different colors, so you will be able to choose the one which suits the design of your home most of all. You can purchase the Retract-A-Gate Safety Gate in black, white or café colors. 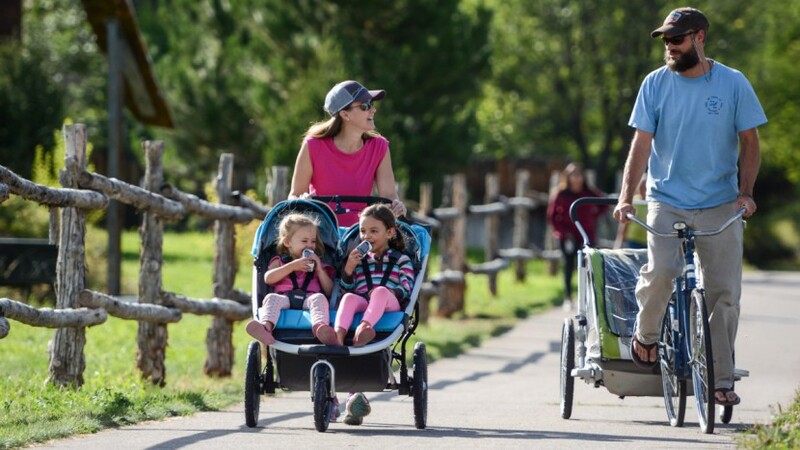 To sum up all pros and cons it should be said that this option will be a good choice that will perfectly manage with its main task- providing the maximal safety level for your lovely kids. Continuing our review, we are ready to present you our second option of the best retractable baby gates available nowadays. These gates are created by the Summer Infant brand and have the whole list of advantages. Let’s consider all of them including some drawbacks also. First of all, the main thing that differs this gate from similar options made by other brands and is one of their main advantages is their construction. 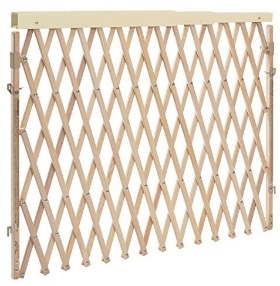 With the width of up to fifty inches, this gate will fit any doorways or hallways. 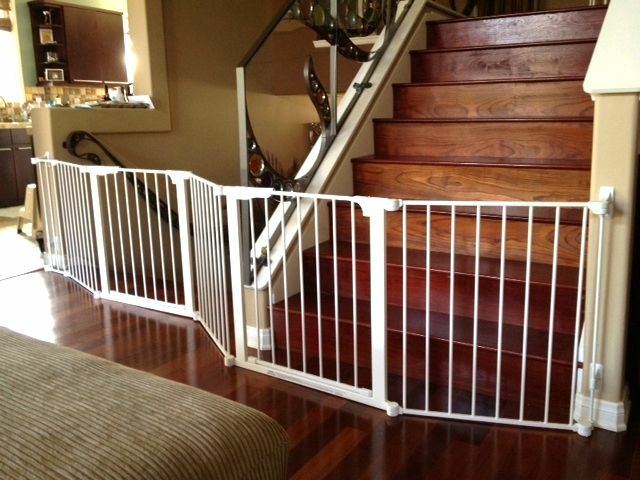 You will be able to install the gate in the wide space as well as in the narrow top or bottom of the stairs. The height of the gate is thirty inches, so you can be sure that your active and curious toddler will not climb over them. The maximally recommended age of kids for this gate is up to two years. The locking system of the gate is also on the high level and as well as the previous option, the Summer Infant baby gate comes with the child secure locking system. Just push down to lock it and pull up to unlock- nothing special and difficult, but fast and convenient. The gate is made of the decorative mesh with the simple design, so it fits most of the homes. 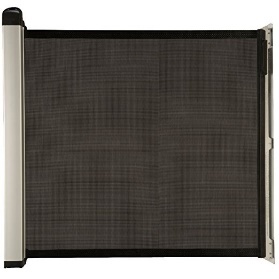 Gate is durable enough, but note that with the process of time the fabric may lose its durability. This is the main disadvantage of the gate. Another disadvantage, which is not so critical is that for some parents it may be quite inconvenient to unlock the gate with only one hand. The weight of the gate is six pounds, which is a result of its durability. As well as the previously mentioned option, this one is also one of the heaviest gates in our list. Unlike all other options available today, to keep this gate out of sight you don’t have to look for the free place to store it, all you have to do is to restrict it. 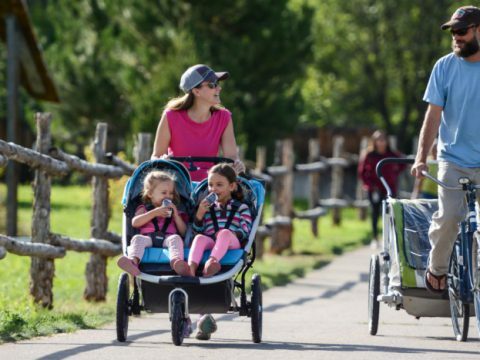 Summing up everything about the Summer Infant gates our verdict is positive and we highly recommended this portable and durable option for all parents. Gate will excellently perform their main task. The third position in our review is occupied by the Evenflo Expansion Swing Wide Gate. This is probably the most stylish and nice option in our comparison chart. With the homey and cute décor, this gate will become not only a reliable protection for your kids but also a nice accessory for your home. The gate can be used inside as well as outside. With the width up to sixty inches, you can place it either inside your house on the top or bottom of the stairs, in the hallways, doorways or outside on the porch. Wherever you put this gate, you can be absolutely sure that your kids will be safe and sound, because the gate is sturdy and tough. 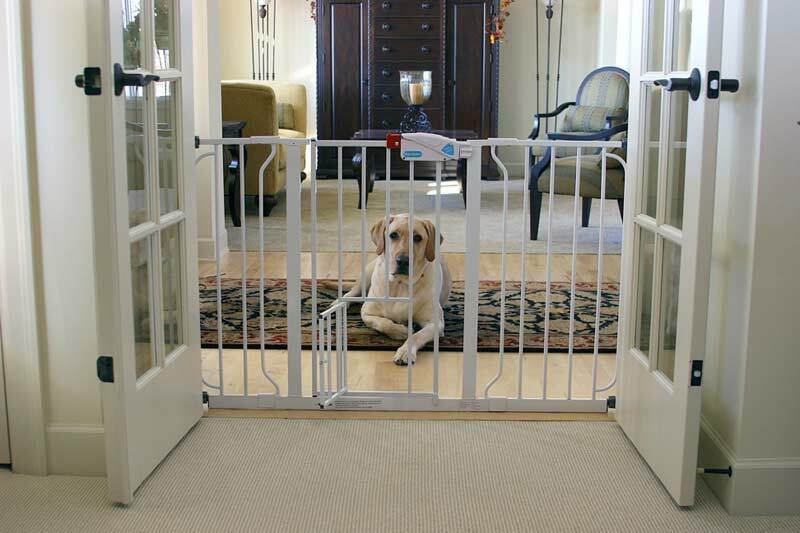 You can also use this gate for larger pets, it is durable enough. Speaking about the disadvantages of this cute wooden gates we can’t skip the fact that because of the material gate is made of, it is the favorite thing to chew for young puppies. If you have such cute little monster which can’t live a day without chewing or drool something, be ready that this gate may suffer from it. The gate is reliable and will provide your kids with the highest protection due to the tough material and thirty-two-inches height. When placed the gates you can do everything you need without any worrying that something may happen to your lovely kiddo. We mentioned that this gate can be used for large pets also, but note that it doesn’t work for cats because they can either squeeze through the wholes or jump over the gate. The material of this gate doesn’t only looks nice and cozily, but also is ecological and pleasant to the touch. You shouldn’t worry that your child can scratch hands. The gate is simple in use- you can open it only with one free hand without any problems to pass through to your little one. Altogether, the Evenflo Expansion Swing Wide Gate is a good versatile baby gate. You can use it wherever you need and enjoy their cozy design and nice wooden texture. Your children will be in a complete safety, so this option is definitely worth to be included in our list of best gates for babies. We are close to the finish and in the fourth position of our review, we are glad to present you the Lascal KiddyGuard Avant retractable baby safety gate. The main thing that this gate can boast of is that it is certified and approved by both the USA and European standards. None of the other options on our list doesn’t have such certification. This gate is also the most lightweight model in our review. 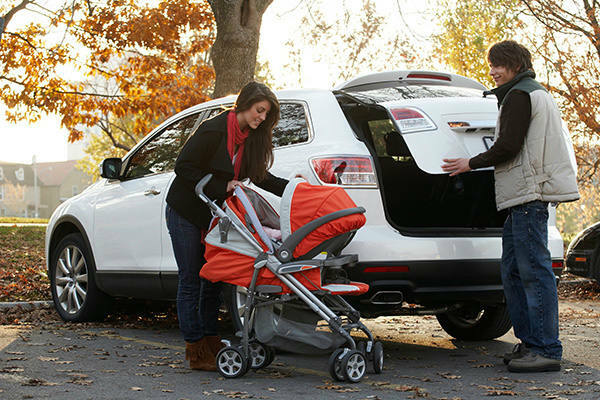 With the weight of less than three pounds, it is the much more portable option in comparison with baby gate reviewed above. But don’t think that light weight means less durability, this gate is rigid and durable enough to use it not only for your lovely kiddo but also for pets. Here we should add that if you are going to use this gate for pets, note that this option for cats, it will not work. Cats will not be able to resist the temptation to scratch the fabric, which can damage it. Let’s consider main advantages of the current model. First of all, this gate is made of a durable transparent fabric, which gives you an opportunity to look what your child is doing. Also, this gate is easily opened, so you can pass through even with one free hand only. You can easily install this gate using your tools. It will not take you more than ten minutes of your time and minimal efforts. Gate is quite high, which adds safety, so you can be sure that your curious fidget will not climb over it. 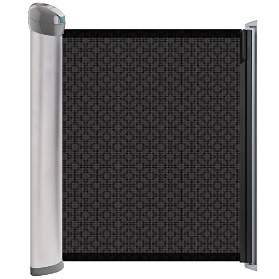 As well as other options presented on our list, this one is retractable, so you will not have to search for the free space to store it when you don’t need the gate anymore. Among disadvantages of this model is probably that you can’t use it for cats risking to damage its semi-transparent mesh. All other features are on the high level including its durability, lightweight, price, and convenience in use. We came to the final of our article and want to present you our favorite option- Dreambaby Retractable child gate. There are some reasons why we love this model so much but let’s start from the beginning. First of all, the main advantage of this gate is that you can use it both for children and pets (is recommended for small and medium-sized pets). Fabric from which the gate is made of is durable and soft at the same time. Your kids will not be hurt touching it. This fabric is also can be used outdoors. Even if it gets wet under the rain, it will dry off really quickly. This makes the gate a great choice if you want to put it outdoors. The width of the gate can be changed up to fifty-five inches, so this option can fit stairs, doorways, hallways or bigger doorways. You can install it quickly. All you have to do is to install two brackets in two places for detaching and attaching this retractable gate. The gate can also be opened easily, so you don’t need to make special efforts and put stuff on the floor if you have only one hand free. To lock or release this gate you need to press on the lock and turn it after, what can be easily done with one hand. You can easily open the gate due to the simple but reliable locking system. 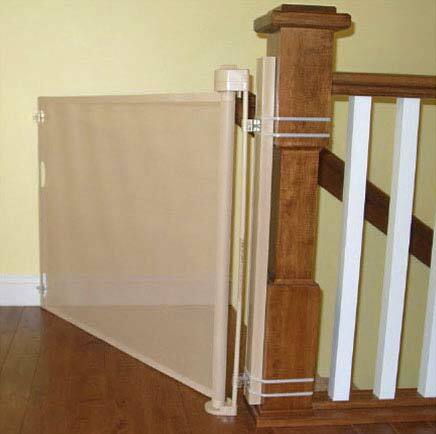 We think that these advantages are more than enough to make this gate on of the best baby gates available today. 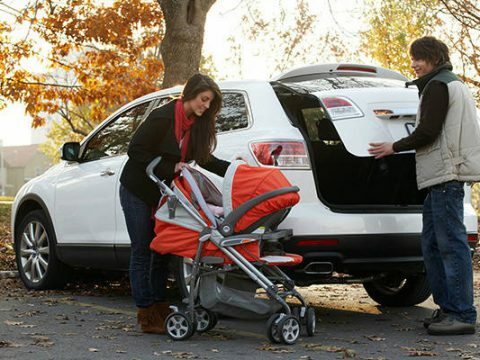 If you want to provide your little one with the maximal protection and comfort, you will hardly find a better option. To make a short conclusion we want to say that the retractable baby gates are a new generation of the usual baby gates with much more advantages. You don’t have to mount it each time when you need the gate and unmount when you want to keep it away. These gates are not so bulky and heavy as the usual ones and are definitely more convenient both for parents and children. If you want to find the best way to protect your kids and provide them with the maximal comfort- retractable baby gate is what you need. Each of the options reviewed in this article is worth purchasing and will serve you long and properly.